First of all I would like to point out that, siphon had been around for a long time dated few hundred years ago. Siphon usage ranging from transferring fluid from one container to another right to flushing the toilet. Most usage of siphon involved a fixed amount of fluid to be transfer to another container, such usage of siphon don't require it to be operating continuously without human intervention. Toilet flush for example require human input to create the flushing effect from a siphon mechanism, and the flushing stop when cistern is depleted of water. Continuous operation of these siphon are not needed. 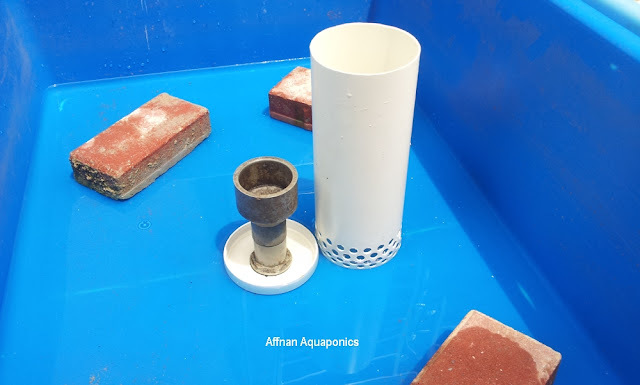 In Aquaponics due to the nature of system arrangement, continuous operation of siphon is necessary with constant water flowing into the container. 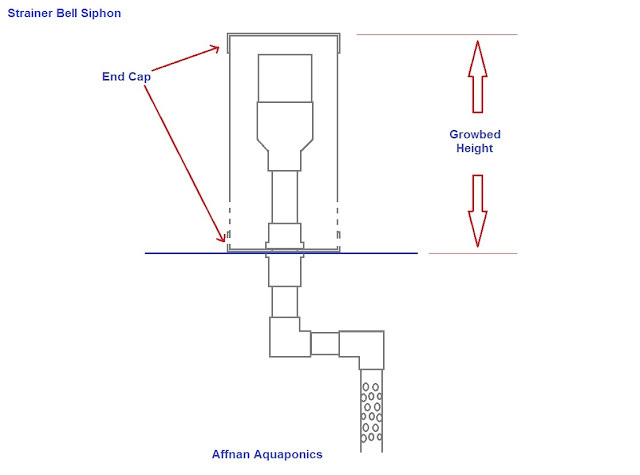 Siphon drawing water out creates "Flood and Drain" cycles that promote Aquaponics balance. No one living today could claim have invented the siphon, nor claiming pattern for such. However improvement to siphon design to make it reliable or use able to an application can be considered as an Innovation. An Innovation deserve to be recognized if its significantly change the way things being done. I like to compare, a redesign Siphon to that of a shoe. Shoes has been invented long time ago, however shoes the late Micheal Jackson use for his moon walk was design by him and accepted as a pattern. He may not invent the shoes but he make it better to suit his purpose. Explanations that follow below are the results of two years of experimenting and studying the siphon... eight months of experimenting with endless siphon design, most siphon have been tried until this current design is met, and the remaining months to refine the design and understand it principle to tweak and tune it for better function. What you will find below are the way to make this valve, how to adapt it to your setup and some simple task to do in the event it fail after deployment. A lot of effort was put into this and it would give me great satisfaction if you succeed in using it for your system. This is the schematic of my bell valve. I will slowly add here the write up, on how the Siphon function and the various adjustment done to make a siphon function as it did. 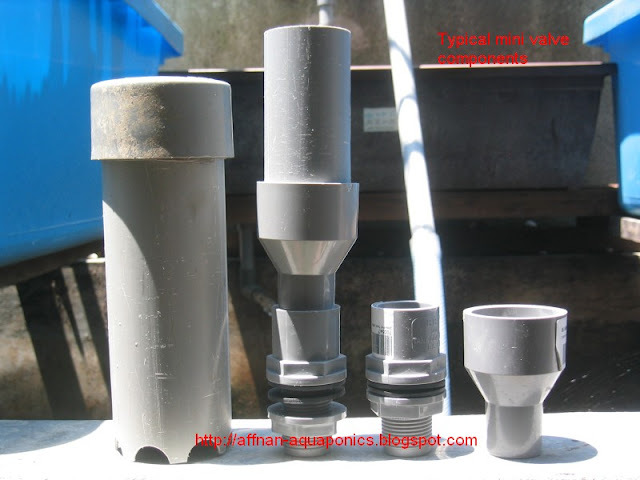 Before I proceed in explaining how mine work, let us have a look at the basic stand pipe siphon below and the various method used in an attempt to make it use able in Aquaponics. This is the baseline design for a siphon, what needed to be done is to make changes to this basic design to make it better. In order to make improvement we must know what are the variables involved in a siphon and how can these variable be change to cause a change in the siphon behavior. 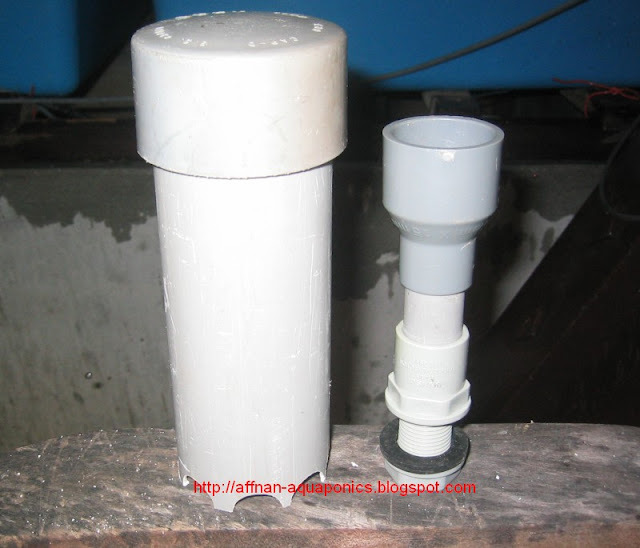 In this basic siphon to get the siphon action started is just a matter of getting water flow into the growbed or container large enough to cause the siphon action. Water flow in rate requires to start this siphoning is directly proportional to the size of the stand tube. Therefore starting a siphon is easy, what difficult is to cut-off that siphon action once water is drained out. It may appear easy, people that has never make a siphon may think once water is drained out and the siphon will draw air and cause the siphon to stop. However that is not the case with an Aquaponics setup, which has continuous water supply coming into the grow bed. This water flowing into the bed earlier which much needed to cause the siphon is now the problem in causing this siphon to cut-off. This continuous water in which cause the siphon to refuse to stop and continue to draw water out is call the "Equilibrium Flow". This is the killer of siphon. Why do equilibrium flow happen ? It happens because the water needed to start the siphon is the same or more then that require to sustain a continuous flow. How do we stop equilibrium flow ? Ensuring the difference between water flowing in to make a siphon and water needed to sustain a continuous flow large. Ensuring water flowing out of the siphon at the end of cycle (residual flow) will still be strong enough to pull in air causing the break. We have to make a siphon to start with less amount of water flow in, to that of the same size basic siphon. Make a siphon with strong residual flow. Which would make the difference above large enough to ensure no continuous flow is maintain. But its not a car ! Tuning a siphon is very much like tuning a car for better mileage. To get better gas mileage its a combination of items need to be check or adjusted, fuel air mix adjusted, spark efficiency, timing accuracy and to the extend that tire pressure need to be check. This cumulatively make a car more efficient thus improving mileage. In a siphon, multiple factor are involved to make it efficient and thus reliable. Some if not all these factor need to be improved to ensure trouble free operation. Below are various methods use to help this happen and to certain extend helps in achieving this objective. How do bell siphon achieve this ? This is a long explaination and thank you for reading it. Below are variations of my valve. Valve A utilize the elbow, Valve B slight restrictor and Valve C with a longer down tube. All these difference variations do one function, aid in producing siphon action with lesser amount of water flowing in. These various modification to the outlet are part of the tuning for a reliable siphon. More alteration needed to be done to ensure the margin of flush and equilibrium flow is widen. I work in the aerospace industry for almost 30 years, from day one we were taught about the Bernoulli's Principle and on how lift achieve with this principle. I apply this to the valve design to do what it need to do, to create an earlier flushing Siphon. Bernoulli's Principle is a physical phenomenon that was named after the Swiss scientist Daniel Bernoulli who lived during the eighteenth century. Bernoulli studied the relationship of the speed of a fluid and pressure. The principle states that "the pressure of a fluid [liquid or gas] decreases as the speed of the fluid increases." Within the same fluid (air in the example of aircraft moving through air), high-speed flow is associated with low pressure, and low-speed flow is associated with high pressure. This phenomenon applies to the lift produced by the wing of an airplane, i.e., an airfoil. The airfoil is designed so that the air moves more rapidly over its upper surface than its lower surface, thereby decreasing pressure above the airfoil. At the same time, the impact of the air on the lower surface of the airfoil increases the pressure below the airfoil. This difference between the decreased pressure above and the increased pressure below produces lift. Thus, a wing with more curvature on the top surface (greater camber) has greater lift than a wing with flat surfaces. Apply the Bernoulli's Theorem to the siphon, this is what you get. There is more to it than just this. Bernoulli's effect will cause siphon to occur with less water flowing (strong initial flow) and strong residual flow couple with offset stand tube contour to produce unbalance water column and finally the outlet restriction or interference causing even lesser water flowing needed hence assisting siphon lower flow starting and equilibrium flow termination. Above statement takes into account about 4 or 5 different variables to ensure reliable siphon. Volume Ratio between Stand Pipe exterior water column within the bell to that inside the standpipe and outflow, more in the stand pipe the easier to cut off. Making the funnel wider on the top should make it better and making the stand pipe length tall also have same effect on valve to make water cut off easier. Then there will be a limit to the height of the grow bed that prevent this arrangement, but wider funnel is do able. To improve further this design, what needed is to make a smooth funnel for the Bernoulli's effect to be maximized. This is to the extend that I will explain it, going deeper would require mathematical calculation and formula which I feel not necessary at this point. My intention is to have this valve easily made by anyone to such an extend that no one could capitalize on it since its so easily made. What else to be tested ? Valve A is base on the outer stand tube column offset only to cause water unbalance. Valve B was mentioned by simo@backyardaquaponics.com that having a pin hole to have air leaked in the bell may assist in water cut off. These on their own, may or may not be sufficient to cause the much needed equilibrium cut-off. This siphon outlet attachment is made for high water situation on my set. This siphon outlet will provide aeration with high water level and silencing of siphon outlet at lower water level and it can be view here for the completed work. In this installation Here I remove the bell and use the outer strainer as the bell itself. Thanks Alan, I am experimenting with various blogger.com editing features. Hopefully nothing get missing. I've visited your blogsite, you are located in Thailand ? Thank Dan, good luck on your setup. East Texas, must be a beautiful place. I've been to San Antonio years ago. I like your invention/improvment to your Bell Siphoning System I am trying to start a Ponic system myself Aero/Hydro/Aqua but living in Brooklyn New York and my place is small but I am going to still try, Thank you for your info on your Bell siphon system (Affnan's Bell Siphon System) best wishes in all your indivers. @Yahya, thanks for comment, space is not a big problem in Aquaponics. My setup is for small area.. and the growbed over the tank method do not take a lot of space. Affnan, I'm adding a link to this page onto my blog site. Should help many people who want more explanation and details for building siphons than I can give quickly. Affnan, can you please explain the purpose and function of the '4mm leak hole'? Primary purpose is to draining the gb if you decide to periodically switches off the pump. It also serve as an indicator to show pumps all is well. If you do not see the drip flow.. it could be pump fail or siphon is dirty and need to be check. However, the siphon will work fine even without the hole. Its a recommended option to prevent water remaining in the gb during my switching off period. Basically its take care if you decide to use timer on gb. After using this siphon for a long time I would recommend the hole is about 5 mm, to prevent clogging. However even if the hole is clogged the siphon will remain functioning without any problem, its not mandatory to have it. Additional note : Its best to drill the hole angled downward or slopping down to reduce chances of clogging. Hello. I wonder if you could help me with a little problem. I want to construct a mega-siphon linking 6 IBC grow beds. 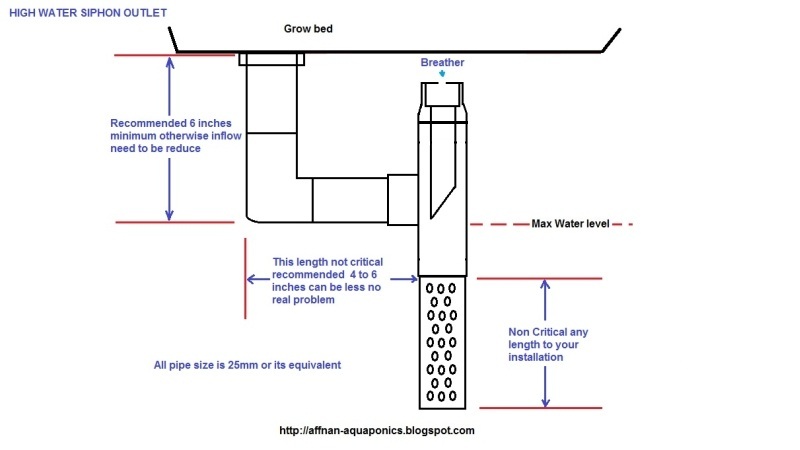 Given the information below what diameter stand-pipe and sump drain line should be used to drain the system? 1. 6 IBC growbeds (350mm) --> will hold ~1200L of water assuming 40% void ratio of gravel. 2. water inflow will be approximately 3600 Lph to acheive ~3 flood-drain cycles per hour. 3. using 1-inch line to connect each IBC media grow bed to Mega Siphon. @scottefontay, you only need to take into account the 3600lt/hr rate to design a siphon. Because this is the most important figure to take. So working on that figure, my 25mm or 1" siphon stand pipe will work up to 1400 ~ 1600 lt/hr flow. You need a bigger stand pipe. I would recommend a 2 inch stand pipe with 3" to 2" reducer or bigger, but don't exceed 1:2 ratio, if cannot get reducer you can flare it top to make a trumpet like shape funnel it will work. Bell size must be able to take the widest part of the stand pipe, I recommend for 3" you need at least a 5" PVC pipe. Handling that volume of water, you need a good initial vertical from the siphon outlet then an elbow one would do, if you could have 12" of initial vertical as a minimum, it would be great. Tuning this siphon to work will be fiddling with this downward vertical and the stand pipe funnel. You can reduce water flow, don't really need that high of a flow rate, but if you do then these are my recommendations. Thanks for the info. I think then that I will try 2 things. 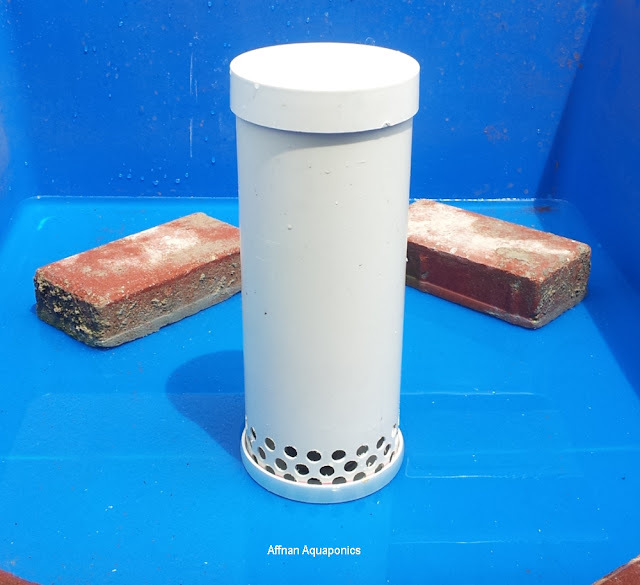 1) a single Mega-Siphon for a ll 6 beds using a 2 inch drain with a 4 inch to 2 inch reducer. A 6 inch bell will work for these sizes. I will use an 8 gallon plastic pail with appropriate plumbing as the external housing for the mega siphon (a bit taller than a standard 5 gallon). 2) If that doesn't work I will use two Mega-Siphons, one each for three IBC growbeds. I will use 1 inch standpipe and drains with a 2 inch to 1 inch reducer and a 4 inch bell. These to be constructed externally using a bucket as well (much cheaper than assembling the housingout of larger PVC fittings!). Ideally I would like the two separate systems to be a 1.5 inch drain and standpipe with a 3 inch to 1.5 inch reducer and a 5 inch bell, but alas, 5 inch PVC is not a standard size here in the US and I cannot find it. If there were another product or object that could be easily found to use I am open to suggestions. I'll let you know how it went after I experiement on Saturday. I am a newbie .Thanks for a great informative site. That's a very small system, a siphon will work but require more maintenance due to its small size. 20mm stand pipe siphon are recommended for small set, smaller than this will be very difficult to get right. Timer system is easier on this size. Hi Solarit, thats a small unit. I would recommend a 20mm standpipe bell siphon. But this size you need to do more maintenance since its small root can out do it. I am impressed with your knowledge of autosiphon systems. Could you help me design one for my growbed which is 25 ft in length, 2 ft in width and 1 ft depth. Please also tell me the best location in the growbed to place this autosiphon. Apologise for a very late reply, Siphon is best to be at centre of growbed so that water outflow will be even. However I do not recommend a growbed for Aquaponics to be 25ft in length, its best to split it in 2 minimum or 3, then its more manageable with one siphon at each segment. You can use the standard 1" stand pipe siphon for your installation. Thank you for great information! I have a question... My siphon will have to travel about 6 to 10 feet (2+ meters) horizontally before reaching my sump. I can easily do the elbow design 6 inches under the growbed, but I see in your diagram the horizontal pipe is 4-6 inches long after the elbow and before the air intake. Would there be any problems if instead of 4-6 inches that was 6-10 feet? For such a long return travel its advisable to put a "T" breather on that 6~10 ft run near the growbed. Its just a T on the 6 ft line with a vertical air breather. This is widely use on various setup if using siphon over a very long return. I appreciate all these drawings as they really make it easier to understand what is happening with the set-up. I didn't understand the loop until you made the drawings. I've followed your blog on and off for over a year and yours is one of the best aquaponics blogs I've seen...or at least I can say it is the one most influential for me. Some day I'd like to set up a system like yours, except that we'd need to worry about things freezing in the winter. Appreciate your comments, I try to make drawings and explanation as simple as I could, English is not my native language its a bit difficult. Currently I am not active since as my last few post, situation no right yet, I'll be active again in few months time once all my problem ironed out. Great website! I live and teach at an International School in Kuala Lumpur, and I would like to aquaponics or hydroponics as a class project with my students. Could you please contact me so that we could discuss some options? I am trying to determine a budget for this type of project and find out where I can buy the materials. Why a bell siphon is needed instead of a simple overflow standpipe with a little hole to drain water out and a timed pump ? As I get closer and closer to beginning construction of my kitchen-window setup, I'm nailing down details and every recommendation about siphons leads here in the end. People out there really respect your work and openness in sharing it! Thank you! The grow bed is 44x44x12 inside, will always have ~2" water at the bottom, and the ebb/flow zone will be 8". The fish tanks up-top are where I'm going to raise some crayfish and some cherry shrimp (well, I'll try) in addition to in the main fish tank, along with water lettuce or water hyacinth for filtration. My pump is adjustable, and I'm expecting ~125-200 GPH (~500-800LPH)with the head/pipe run I'm using, but won't know exactly until I start things up with pipe attached (I'll be reducing with 1/2", from 1" out at the pump, because the pump I picked up has room to grow if I add another bed higher up later). In my grow bed, (taking into account the space media takes up) will be draining ~25 gallons (~100L) of water each cycle. I'm expecting 4-6 cycles/hour. Am I figuring things out in a reasonable way - or am I way off the mark? Which siphon size should I start with for the best chance of only needing minor adjustments (not having to drill a brand new hole - especially a smaller hole! ;) ). Thank you again, for any advice you can provide. I consider you as one of the aquaponics-Guru of Malaysia and this is an excellent blog for its well documented experiments and articles in aquaponics. 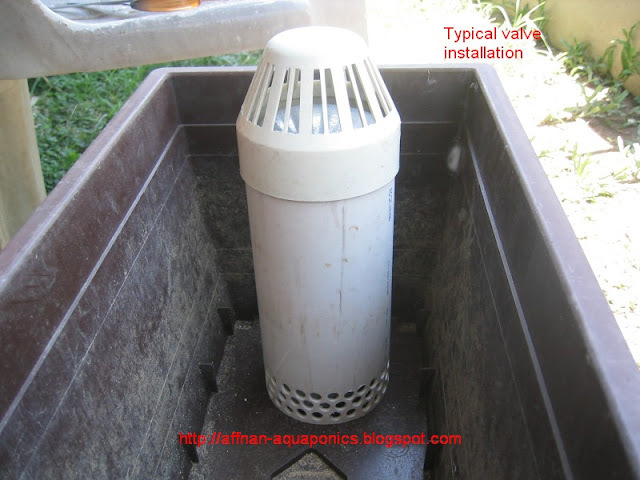 I'm one of the very-proud Malaysians to note that the japan-aquaponics.com had also referred to your idea to put the reducer on top of the standpipe as the first used or probably first written about in their "Japan Aquaponics DIY Aquaponics Guides: Autosiphons - Bell Siphons & Loop Siphons". Congratulations! FYI I'm in the middle of setting up my own mini version of aquaponics set using some of your ideas and designs. I hope your bell siphon will work well with a shallow 1.5(L)x1.0(W)x0.3m(H) fish tank. I'm thinking of an alternate flush siphon from two growbeds for the water level in the fish tank to be at least 3/4 of its maximum volume. Do you think that this ratio is achievable? Thank you in advance for the advice. Hope to hear from you soon and your new aquaponics set. That fish tank will hold at least 100 US Gallon, and with 2 growbed it should take 15% of that 100 gallon each, 2 growbed will take maximum 30% water from tank. Its achievable with 2 growbed. My new setup will use 2 GB of the one that I normally use and with same almost same size tank you use. Would adding a snorkel to help break the siphon be a helpful thing to do? My design don't need the snorkel. 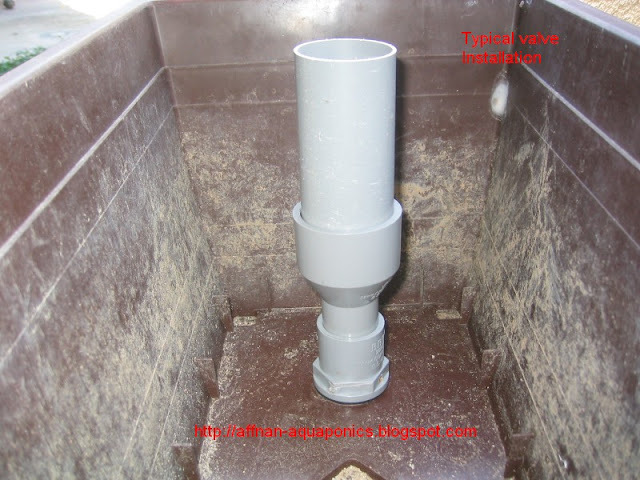 If you are using a stand pipe without the funnel part on top I believe you will need it. Is there a ratio between the size of the fish tank and the grow tank? Is there any way to figure out how many fish and what size of fish are needed to make sure there is plenty of waste for the plants to remain healthy? Just trying to start off in this endeavor and am lost in how to determine this. I appreciate the effort you have gone to in providing this information. You really understand the bell siphon and describe it well. I have a question and please forgive me if it is too basic. I have an IBC grow bed about 250mm deep so it probably contains about 100l of water when the siphon starts. I am using a flood and drain system whereby the pump is on for 15 minutes and off for 45 minutes every hour. I have a tap on the outlet to the grow bed so I can regulate the flow to the bed. Ideally I would like the bed to flood and drain a couple of times during the 15 minutes fill cycle. I am using a bell siphon stand pipe made from a 600ml drink bottle with the base cut out going into a 25mm pipe with elbow etc as you describe. For the bell dome, I have a 1.25l plastic bottle, inverted, with the neck cut off. The bell dome is about 35mm higher than the stand pipe. The siphon starts easily and has a strong flow, so it is working well in that regard. However, I cannot get it to stop until the pump stops. The logical explanation is that I am delivering too much water. However, I have dug down into my gravel about 40mm and can see the water rising as the grow bed fills. As the siphon starts (about 25mm from the top of the gravel), I then see the water level falling rapidly. So this tells me that the siphon is draining water faster than I am delivering it from the pump. However, the siphon does not break, and water keeps draining until the pump stops. The output from the siphon does not appear to reduce in flow rate very much from when it starts until the pump stops, although I suspect it must do so. When the pump stops, it does not take long for the siphon to break, indicating that there water level is quite low, even though the siphon keeps running. I have even tried adding a breather tube to the bell dome as described in some articles but it makes no difference. Can you suggest a design to accomplish what I am trying to do with 2 or more fill and rain cycles in a 15 minute pump cycle? I am now thinking of using 40mm stand pipe with a 40x80 reducer for the bell siphon. Not sure if this will be too big though. In funnel siphon this phenomenon can only be due to too much water in-flow. Two things can be done to get it right. 1. Reduce the water inflow, as it start to do the continuous draining slowly reduce the inflow to get it to cut out. 2. Try lengthen the first vertical down outlet, lengthening this will give more suction for water drain, this will help in cutting out the siphon to some extend. I don't recommend 40 mm stand pipe, it will be too big and will requires more water inflow to work. Try the easiest first that is item 1. BTW, with a siphon you do not need a 15/45 system.. the pump can be running for 24/7. If you do a 15/45 cycle then you will need a drain hole to drain the growbed during the pump off period. Thanks for your quick reply. I have a drain hole which works fine during the off period. I have spent more time this afternoon playing with the siphon. I replaced the plastic bottles with a 25x40mm reducer. This worked a bit better. I can't lengthen the downpipe too much as it will be under the water level of the fish tank. I tried a 25x50mm reducer but this did not work as well as the 40mm reducer for some reason. I wondered whether increasing the bell dome height above the standpipe might make for a weaker suction force and allow the siphon the break earlier. I lengthened the height of the dome bell by around 20mm and it seemed to make the siphon break earlier. I am asking for quite a lot - i.e. the bed to fill twice and drain within a 15 minute period. So I need a reasonably high flow to fill quickly and a low flow to happen during siphoning. Maybe it's time to add some electronic control - although I would like to keep it really simple. May I know what is your pump rating and why is it so critical to get the 2x cycle during the 15 minutes ? I made a SketchUp design of the construction of the siphon Bell-Affnan. The file is in the link below. This is a great DIY teaching. I have a problem with my bell siphon whereby lots of pebbles stuck in between standpipe and bell dome. In such, the siphon not kick starting and I have to do my maintenance after 6-8 months once. So, all my plants are need to start over again. Do you have any suggestion? Now I use pots filled with leca, any cleaning of gb I just remove the plants with the post. So minimum damage to the plants. I also use gutter system, this style has no such problem anymore. You are excellent. Thank you. awesome bro Affnan. im following u since 2009.alangkah bagus dapat lepak berkongsi idea bro..thanks bro. Great website and schematics - thank you! I am using your ideas to build my system. let me put my questing in short. i have a fish tank of 200ltrs capacity. and 2 growbed with 100 ltrs each (just a sliced 200 ltrs water barrel). Now would you recommend your standard siphon or the mini siphon for my growbeds !!! Thank you for your great blue print. I am using your design to build my system. I am in Montreal, Canada. I have a an old greenhouse 20' X 65'. I wonder if you have any recommendation. Thanks Affnan for your great and detailed informative post. I built a small system with regular 5 gallon water bottle with 5 ornamental fish. Idea was from a you tube clip I saw a few months back. I had to work on the siphon for a few days modifying and changing standpipe configuration many times cos siphon would break once or twice then, equilibrium problem!! A few days ago managed to get the cycle going good, still good as I write this. I am from Sungai Petani, this morning as I was googling for fish fingerlings came across your site, saw your detailed info and clear explanation why equilibrium occurs. BTW I am growing 2 small chilli, 2 pudina, and 2 daun bawang plants. Thank you. Cheers.